Located in Beautiful Bend, Oregon, we serve delicious, plant based superfoods to power the active lifestyles of locals and visitors. Owners Tiff and Mat Bilodeau, a husband and wife team, fell in love with Bend and found a way to share their love of superfoods - smoothies, juice and bowls - to power the passions that draw others to this amazing town. 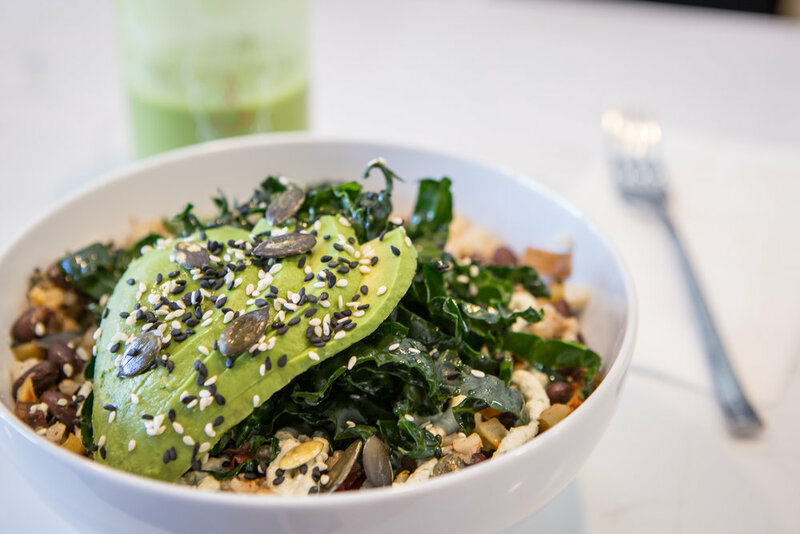 Whether you run, ski, ride, SUP, climb, yoga or crossfit, the healthy, hearty meals and drinks at Fix and Repeat are sure to fuel your movement. The concept was dreamed up as a way to power all your activities and help you recover better to do it again the next day, or even later that same day... That's where Fix and Repeat came from, get it? Run, Fix, Repeat or Ride, Fix, Repeat. Tiff and Mat strive to create sustainability through business (see Mission: Fix & Repeat) and a fun, beautiful place to hang out in Bend. A place where the food makes you feel good, the environment and staff make you feel comfortable, and you can have a drink too. We can't wait to meet you! Email mat@fixandrepeat.com if you are an artist and are interested in showing your work. We love art! In fact we love it so much, that we had a 30 foot rail installed to hold art. We will be partnering with local artists to help them show their work, and help make our space beautiful. We do not charge any commission to show art. Instead we ask that you donate 5% of sales, which we will match, to Oregon Wild - a local nonprofit environmental group. FIX & REPEAT means more than just to Fix (repair) your body and Repeat your sport again. We also strive to fix the planet and the community around us. We want you to always feel like eating at FIX & REPEAT is making you, and the world, a little better every time. It all starts with plant based (vegan) eating. Simply by leaving animals off your plate, you save immense resources including water and land, and you greatly reduce your carbon footprint. As an added benefit, no animals will be harmed, and we love animals. As an added benefit, an animal product free body can recover faster from workouts, digest better and operate more efficiently, which can result in a boost in athletic performance. We also strive for a better planet by donating money to organizations that work tirelessly to make a difference. We charge $0.25 for to-go food, all of which is packaged in compostable containers, and we donate 100% of that fee to the Ocean Conservancy. We show art in our space and work with the local artists on display to donate 10% of all sales to Oregon Wild - 5% from the artist and 5% from us. We also partner with companies like MiiR for our logo bottles and camp mugs. MiiR is a B Corporation and donates 3% to clean water projects worldwide. Lastly, and importantly, we donate a portion of sales every month to Oregon Wild, a non-profit organization working to preserve land, save species and fight climate change.